WASHINGTON, Sept. 1, 2016 - The rapid growth of rooftop solar and expected carbon emissions limits are forcing electric utilities and regulatory agencies to write new rules to make it possible for both utilities and renewable energy to continue to grow. That’s a challenge because current regulations make utility company profits dependent on their capital investment in power plants, transmission lines and overall grid infrastructure. The immediate threat to utilities is that net metering rules in 41 states mandate that utilities buy rooftop solar owners’ excess power even when the utilities can generate or buy cheaper power. So utilities, their state regulators, and renewable energy advocates all are looking for ways to resolve this clash between traditional power companies and the growth of renewable energy. 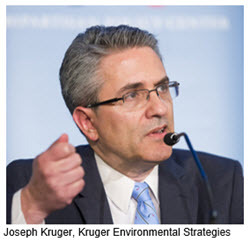 The utilities’ opportunity-limiting dependency on increasing electricity use must change, says Joseph Kruger, principal at Kruger Environmental Strategies and a former EPA Clean Air Markets branch chief. He explains that under current rules, to the extent that energy efficiency, storage, demand response, and distributed generation sources like rooftop solar decrease the need for new investment in power plants and electricity infrastructure, utility company profits shrink and the utilities will continue to resist change. “I think most power companies have already acknowledged the inevitability of carbon regulation,” he says. Georgia Power, serving 2.4 million retail customers, is part of the 27-state lawsuit seeking to overturn the administration’s Clean Power Plan (CPP) to limit power plant carbon emissions. Following the Supreme Court’s February decision to suspend CPP implementation, the litigation’s next step is set for Sept. 27 when the U.S. Court of Appeals for the District of Columbia will hear opposing arguments in the case. Kruger says the challenge to the utilities’ outdated business model comes not just from the Clean Power Plan but also from “declining demand as well as the falling cost of distributed generation and growing customer interest in new technologies” such as distributed solar generation, energy efficiency, energy storage, and demand response. He says utilities and regulators now increasingly recognize the need to assign values to factors such as avoided costs and environmental benefits in their planning and ratemaking. So it’s no surprise that more and more states are conducting “Value of Solar” studies to determine values accurately. New York’s 170 pages of new Energy Vision rules are designed to replace “the conventional cost-of-service ratemaking approach” with “outcome-based performance measures.” Under the new rules, instead of earning profits based on selling more electricity to their customers and building new power plants and transmission lines, utilities are incentivized to boost their earnings by helping consumers improve energy efficiency and install customer-owned distributed generation such as rooftop solar panels. Westar promotes renewable energy, Penzig says, but recognizes the need for new rates for customers generating their own power “to ensure that if they are using the power grid, that cost is being covered, that they are paying their fair share.” This means, she says, adding demand charges and/or new monthly fixed charges. 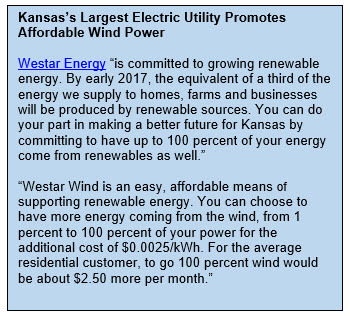 As for what Westar considers “potential benefits allegedly provided by” rooftop solar and other distributed generation sources, Penzig says Westar wants the Kansas Corporation Commission to continue to base rates “on quantifiable costs,” not on “externalities” like environmental benefits that may benefit society as a whole rather than just Westar’s electricity customers. The National Rural Electric Cooperative Association (NRECA) agrees on the need for change. Mary Ann Ralls, NRECA senior director, regulatory counsel, tells Agri-Pulse that while net metering began as a way to support “very small residential” solar power generation, it has morphed into compensating rooftop solar owners “at retail rates for wholesale power and under-collecting fixed costs for serving those customers.” She says possible fixes include adding new monthly charges so that solar owners pay their fair share of grid costs or following the lead of some states like Ohio that compensate solar owners at wholesale rather than retail rates. Ralls adds that before investing in rooftop solar, homeowners should realize there are alternatives, such as optimally sited community solar, for supporting renewable energy without rooftop solar’s extra costs and controversies. Moving from fossil fuels to renewables 'at no net economic cost'?